Made in North America with the same quality components as our 14' Gold Medalist (except for the economy aftermarket "Bronze" safety pads). The Bronze Medalist will have a much better bounce than department store trampolines and is suitable for teenage and adult use. This high quality and durable trampoline makes an excellent choice for the whole family. We also offer this trampoline with a better quality "Silver" safety pad at $1395. 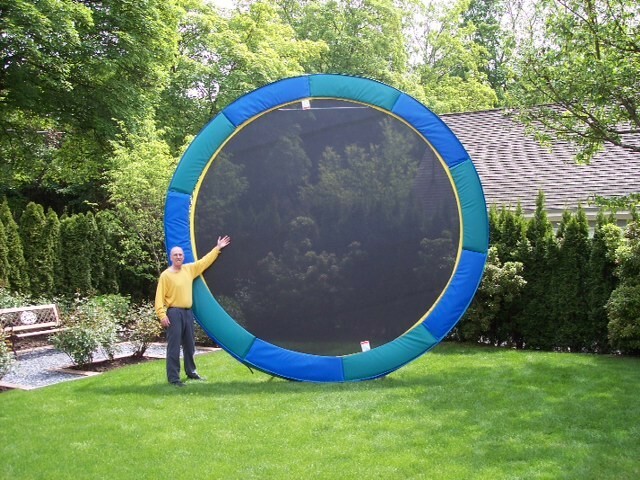 This trampoline is also available in a 12' size "Bronze" at $1195, "Silver" at $1295 and "Gold" at $1395. SAFETY PADS: Good quality 1" thick & 13" wide, all weather safety pads. Upgrade to the heavy duty "Silver" safety pad at $1395. or the deluxe "Gold" safety pad at $1495.